That's right. According to the Census Bureau Daily, February 28th is National Tooth Fairy Day. To celebrate, the Dental Ninja is giving you some "Tooth Fairy Fun Facts." In early European times, it was custom to bury one's baby teeth. This is likely due to the superstition that if a witch happens to get a hold of it, she could put a curse on you. The best way to keep it away from the witches is to bury it. Spanish-speaking countries believe in a "tooth mouse" rather than fairy. The character, known as the "Ratón Pérez" first appeared in a story written for eight-year old Alfonso XIII, as one of his teeth had fallen out. The story stuck, and the character has even been used by Colgate for marketing in Venezuela and Spain. The 18th century French fairy tale "La Bonne Petite Souris" depicts a tooth mouse who morphs into a fairy to help a good queen defeat an evil king by hiding under his pillow. She then tortures him by knocking out all his teeth! This begs the question, why hasn't Disney turned this lovely little tale into a movie? 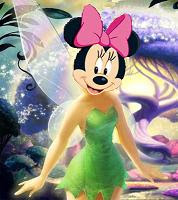 Scotland's lowland areas have a tradition which, like the French fairy tale, combines a mouse and a fairy. The little lads and lassies eagerly await the visit from a white fairy mouse which purchases the teeth with coins. India, Korea, and Vietnam have traditions similar to that of the Japanese in that they throw the exfoliated teeth, however, they aren't as concerned with throwing them straight. Instead, these children throw it and shout a request for the tooth to be replaced by a rodent's tooth. It has something to do with the fact that rodent teeth never stop growing. Children in parts of India will offer their discarded teeth to the sun. The Tooth Fairy as we know her today isn't actually that old. Folklore researchers find the first references around 1900. What you might not have known is that actor Kevin McKidd hails from Scotland, and while his TV show character may be all business, he can be quite the kidder. Recently he told Ellen Degeneres that the locals in his hometown thought he was "nuts" for pursuing a career in acting, and that "the biggest celebrity you can become in Scotland is a dentist." Full story from the Daily Record. How about that? Maybe I need to start promoting my blog across the pond. During the Super Bowl Festivities earlier this month, Meredith Vieira chipped a tooth while trying to tear off a wrist band. This unfortunate incident happened right after I published the warning message from the inhabitants of Iran's Burnt City regarding the dangers of PARAFUNCTION! Obviously Meredith is not a regular reader of the Dental Ninja. Meredith, if someone happens to point this blog out to you, seriously, just use scissors. They're so much cheaper! But you probably know that now. This isn't the first time she's had dental woes. In 2007 she awoke one morning to discover two chipped front teeth. It was likely due to an ice skating mishap the night before, although she has been known to grind her teeth at night. You can't help but feel bad for these poor contestants, who obviously had a giant brain fart at the worst possible time! Also, for those of you who've been wondering, here's a quick follow up to the story of the German dentist who broke into the patient's home to take back his handiwork: The dentist was found guilty of assault and fined 6000 Euros. The patient no longer wears dentures because of the distress caused by the incident. That's right, according to a kotaku.com blog entry earlier this week, when little Japanese boys and girls lose a tooth they don't bother putting it under the pillow. Instead, the custom is to give it a good toss. Maxillary teeth get thrown down towards the ground and mandibular teeth are thrown into the air (the same direction they grow). The trick is to throw the tooth as straight as possible because this ensures that the permanent tooth comes in straight. While this may seem like a bad deal for the child, if it actually worked the family would come out way ahead because of the decreased need for pricey orthodontic work! I'd gladly give my son $10 for each tooth he can get to grow in straight. Better go work on that aim. This past week was the 200th anniversary of the birth of Abraham Lincoln. To celebrate, most employers give their workers something that we in the dental world enjoy on a regular basis: a four-day work week! A dentist broke off part of Lincoln's jaw bone while pulling a tooth without anesthesia. The extraction may have taken place in Louisville, KY in Sept. 1841. It has been said that Lincoln was afraid of dentists, which would make sense given what you just learned. In 1862 Lincoln developed a severe toothache and consulted Dr. G. S. Wolf, who had an office near the White House. As Wolf prepared to pull the tooth, Lincoln asked him to wait. Lincoln "took a container of chloroform from his pocket, inhaled it deeply, and sleepily gave the signal for the dentist to proceed." During his campaign for the Presidency, Lincoln liked to recount how during his childhood he was kicked in the teeth by a horse and "apparently killed for a time." I bet if you asked him he'd tell you the experience was a good preparation for a life in politics. Honest Abe, centuries ahead of his time, was the first to sport a "gangsta grill" when he dawned the flashy chompers for the music video debut of his 1859 hit single "Get Ur Union On." All information was taken from doctorzebra.com and abrahamlincolnarchive.com, except for that last one about the music video. That was actually something I learned from my own research, so, if you need a citation for a research paper, just write "Dental Ninja" and I'm sure it will be fine. The Dental Ninja is in Washington DC this week, lobbying on behalf of the American Student Dental Association. Being involved in ASDA is one of the most rewarding things I've done while in dental school. Tomorrow I'll be meeting with members of congress and asking for funding for the National Health Service Corps (also here) as well as Meth-mouth prevention. These are issues that matter to me and I'm glad I can be involved. Click on the links if you're interested in the dirty details. If not, let me leave you with a great find from Dental Ninja reader Amy. Ladies and Gentelmen, I give you bacon-flavored floss. So you can clean your teeth and continue to enjoy that nice bacon flavor just a little longer. If any Dental Ninja readers order this product, please let me know how it goes. He is doing fine now and the teeth are great. Also worth reporting this week was the story of a man who probably wishes he had the benefit of Nitrous Oxide. Ian Boyntan, a 42-year-old British veteran who served as a medic in Iraq in 2003, was so frustrated trying (and failing) to find an NHS dentist that he took matters into his own hands. Over the last two years he has removed 13 of his own teeth using a pair of pliers. He claims to have suffered from an excruciating toothache since 2006. Looking at the pictures provided in the article, I can see at least six possible toothaches. I can also say that this guy is pretty good. I see 11 intact teeth without broken root tips. My guess is that the other two teeth were so decayed that they crumbled apart on the way out. I'd say 11/13 isn't bad for amateur hour. He apparently also has a good bedside manner when treating himself. He claims, "Amazingly, it did not hurt as much as you might think." Since beginning dental school, I've had several dreams that involve my teeth. Several times I've dreamed that my teeth were cracking and falling apart. In talking with my classmates I've learned that I'm not the only one who has had this dream. 1. I knew it would take a very large amount of composite filling material to fix my smile- at least 20 cartridges per tooth. I was worried about the amount of polymerization shrinkage and the associated post-op sensitivity and risk for fracture. (That's right, I'm even a nerd in my own dreams). 2. I was worried about what would happen a few months from now when I show up as the new dentist in town with holes all through my teeth. Way to make a good first impression, Doctor. Needless to say, I was relieved when I woke up to find I had my normal-sized healthy teeth back. I'd like to hear if any of the Dental Ninja readers have ever had a bizarre tooth-related dream. If so, please leave a comment. Happy "Pet Dental Health Month"
Over 85% of dogs and cats over 4 years old have periodontal concerns. 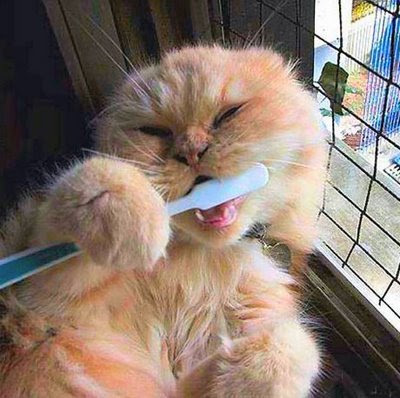 You should brush your pets teeth daily, but not with people toothpaste. Ask your veterinarian for special animal toothpaste. Plaque will first show up as yellow or brown staining where the teeth meet the gums. If you notice this, it's time for a visit to the vet. If you notice this in your own mouth, definitely go see the dentist - but please see someone other than me. Hard food in your pet's diet can help remove plaque, but is no replacement for regular brushing. In most animals, flossing is not necessary because of the open spaces between the teeth. Sharks actually have "wimpy" bites, and are only dangerous because their teeth are so sharp. More on that here. 1. This account of a British dog who spent the day with his teeth glued together from biting into a fast-food menu that came with the mail. The dog, who had been trained to retrieve the mail, apparently couldn't open his mouth, which necessitated a trip to the vet. 2. This blog-post about "MacKenzie Boy," a Boston Terrier located in the state of Washington, who in 1938 was given a full set of dentures. He is believed to be the first dog to ever wear dentures. The little snippet of an aritcle shows the dog being fitted for the dentures, but doesn't go into a lot of detail. Call me a skeptic, but I have my doubts as to whether the dog was indeed able to succesfully masticate using the prostheses. It's hard enough to get people accustomed to new dentures, working with a dog would seem downright impossible!